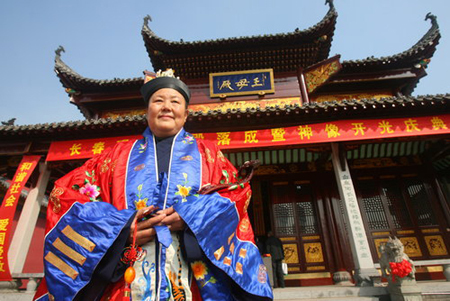 Taoism master Wu Chengzhen became the first female Fangzhang in Taoism's 1,800-year history after being enthroned at Changchun Temple in Wuhan, capital of Hubei province, Sunday, the chinanews.cn reported. The Fangzhang, or principal abbess, is the utmost venerable leader in a Taoist temple. A Fangzhang must be,widely respected among Taoist priests with a strict personal restriction in practicing Taoism. Wu, born in Wuhan in 1957, has a postgraduate degree from Huazhong University of Science and Technology and plays an active role in social religious activities. She became a Taoist priest at Changchun Temple in March 1984 and was instructed by Xie Zhongxin, the 22nd Fangzhang of Baiyun Temple in Beijing. Wu's efforts in supporting orphans and widows, constructing bridges and roads, and helping students from poor families have contributed greatly to society and encouraged and inspired many people. Changchun Temple has donated about 4 million yuan ($586,000) since 2000.